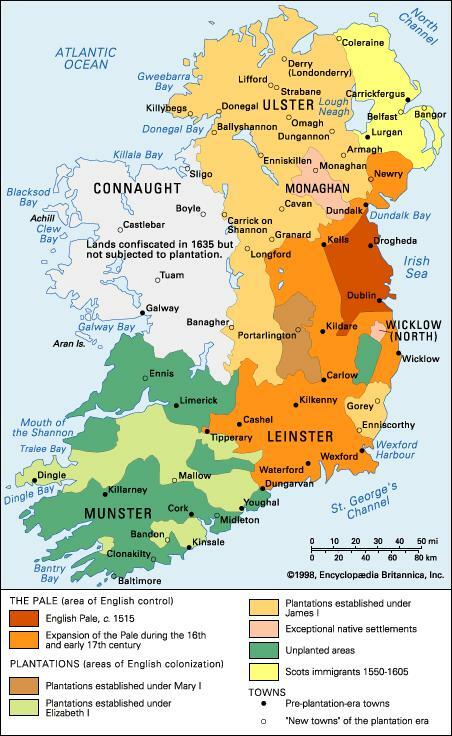 The four provinces of Ireland, demonstrating the progression of English conquest in Ireland and the migration of English and Scottish settlers to Ireland, circa 1515-1625. This was the context in which The Contention of The Bards took place. McKenna, Lambert. Iomarḃáġ Na ḃfileaḋ : The Contention of the Bards. Irish Texts Society (Series) ; v. 20, 21. London: Published for the Irish Texts Society by Simpkin, Marshall, Hamilton, Kent, 1918. 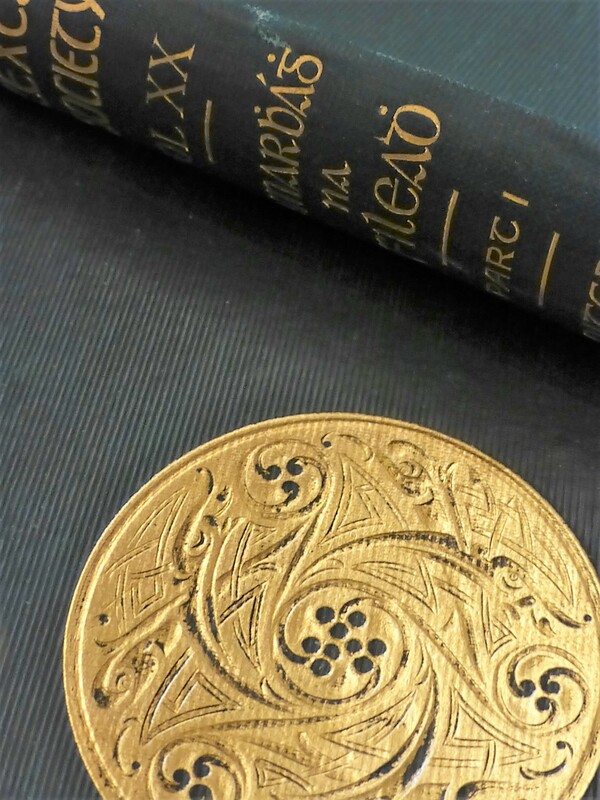 Green binding featuring a gold Celtic style medallion and the series title, title, and author’s name in gold text. The Contention began when a Munster poet, Tadhg mac Dáire Mac Bruaideadha (Tadhg Mac Brody, 1570-1652), criticized fifth century historical poet Torna. In so doing, Tadhg challenged the legitimacy and supremacy of the great septs of Ulster. Predictably, this sparked the poets of Ulster to defend their patrons. In this time, Irish elites, poets, and political leaders were loyal first and foremost to their septs and interested in their own local interests. Even in the Nine Years War, leaders of Irish septs chose whether to join the rebellion, fight against it, or remain neutral primarily based on their understanding of what would benefit their own position. The regionalism, competing loyalties, and colonialist context, to the Contention are fascinating and of great historical significance- as such, they warrant greater historical attention. However, a singular focus on the politics of the poems would obscure an equally fascinating insight into the learned world of the Gaelic poet class. The poems demonstrate not just regional and familial loyalties but, also, profound learning and extensive education. The poets from both sides- who all would have been educated in Irish, Latin, and Greek- drew from the Bible and Classical Greek texts as well as Irish mythical-history to argue their points. The Contention, in fact, was primarily a debate over Irish mythical-history. It is perhaps wise not to try to explain the erudite, verbose, and complicated histories debated amongst the poets in the Contention. It is worth mentioning, however, that the crux of the debate centered on the mythical-history of the supposed division of Ireland, north and south, and, subsequently, which half was better than the other. They traded boasts of their respective kings and insults to the other’s supposed kings, and they also argued over which half had produced more High Kings of Ireland. Much of the content of the debate came from Lebor Gabála Érenn (The Book of Invasions), a work of Irish-mythological history written in the 11th and 12th centuries. It was believed that the book contained absolute “truths” and, in medieval and early modern Ireland, was taken as the source of legitimate knowledge about Irish history. Thus, all the poets frequently referred to it to bolster their claims. The grounding and legitimation of knowledge in written texts was not new then, nor is it outdated now. However, it is something that appears to be increasingly questioned in our contemporary society. The example of the Contention might give credence to such skepticism. Surely we do not believe the mythical components of Ireland’s medieval texts that the poets in the Contention seemed to believe. Further, it is fair to note that the “knowledge” contained in the books served to empower the great families and septs who were the ones who patronized the poets- in other words, the promulgation of the knowledge of Ireland’s medieval texts served the poets’ own interests and that of their patrons. Nonetheless, this does not negate the merits of learning, written texts, and the endeavor for knowledge. The commitment to critical understanding of the world and the academic process is not an endeavor that should be abandoned merely because it can never be perfect. In today’s world, academia is secular and mostly independent of power-sources. More importantly, there is a strict process of verifiable-research procedures and a demand on scholars, especially historians and other humanists, to maintain a degree of skepticism and caution with all evidence sources. Through critical dialogue and scholarly conventions, scholars today have developed an impressive understanding of our world in the various fields of knowledge, i.e. biology, chemistry, history, math, etc. We here at Boston College, and especially at John J. Burns Library, remain committed to this project. After all, it was the fact that these poems were written down and preserved that we even know of their existence. Boylan, Henry. “O’Brien, Donough,” A Dictionary of Irish Biography. 3rd ed. Dublin: Gill & Macmillan, 1998. Burns Library, Boston College. Mathghamhain O hIfearnain, Poem XI, in ed. Rev. McKenna, Iomarbhaidh Na Bhfileadh, 113. 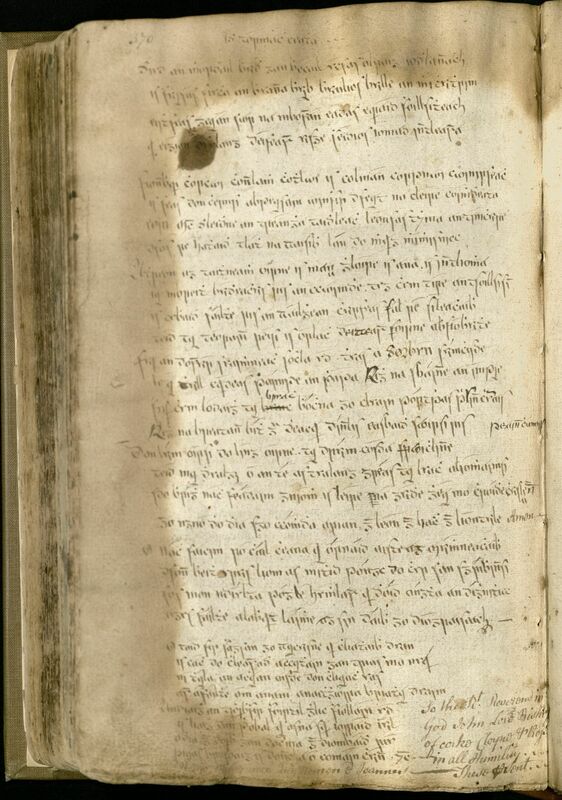 This entry was posted in Archives & Manuscripts, Irish Studies, Student Posts and tagged Irish poetry, irish poets, Nine Years War, Tadhg mac Dáire Mac Bruaideadha (Tadhg Mac Brody, The Contention of the Bards. Bookmark the permalink.